BongaCams has around 4,000 performers and even at off-peak times there are around 100 online chat rooms. The site also encourages users to become models, but this calls for a bit of a wild side and “ready to go action”. I have always appreciated websites that tell you right off the bat how much the video chatting will cost you. BongaCams goes even further by supplying a detailed and accurate price list that any user can go through easily. It’s no wonders though, because this site has nothing to be embarrassed about. Prices are more than reasonable and users will get a lot of chatting done for the cost of a single cocktail in a bar. Chat per minute is at a fixed price, not a range, so there is no need to ask models about the price or wonder if you remembered to check the price before you invited her to private. 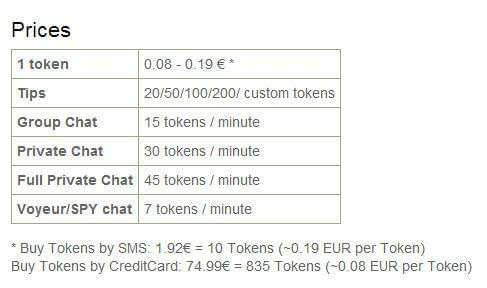 In short: 1 token is between € 0.08 - 0.19, depending on the packages you select. Spy chat costs 7 tokens per minute, group chat is 15 tokens per minute and private video chats go for 30 tokens per minute. A full private chat is the highest priced being 45 tokens per minute. You can tip for 20, 50, 100 or 200 tokens and I am sure those models will show you just how flexible they can be when they are tipped 200 tokens. The credit packages on BongaCams are great. You can purchase just a few Euro’s worth of tokens, if you want to look around first without spending too much. There are larger packages too and they are well worth your time and money. 99 Euro for no less than 835 Tokens, which is around 0.090 Euro per token, give or take. Most major credit and debit cards are accepted on BongaCams or on Bongacamstokens . You can also make a Wire Transfer if you prefer or even use the popular SMS payment option. The Bonga Cams motto is: No Monthly Charges, No Hidden Fees, No Shady Business, and the site stands behind this motto. There are only 2 kinds of membership available on BongaCams and they are both free. An annoying pop-up, urging you to upgrade will appear on your screen often. When you get tired of that painful pop-up window reminding you to upgrade, you will end up upgrading. Upgrading is free too and no subscription fees are required. Cost to Join: FREE, just buy tokens in any amount. Information Required: Credit Card number. Friend List – Just like a Favorite List. Invite Your Friends to Join BongaCams and Get Tokens – IF they buy tokens and use them, of course. The weekly BongaCams Queen contest – At the end of every week, the 3 top-earning performers receive a prize - $1000 for the winner, $200 for the first runner up and $100 for the second runner up. You can see who won each week, and previous weeks, this helps see who the most-popular and hopefully the best webcam models are. The weekly BongaCams Top 15 Contest - At the end of every week, the top 15 models with the highest number of BongaCams points win a prize – as high as $500 for the 1st place winner. Users can see the lists and use them to choose better-rated models. Getting around BonaCams.com is amazingly easy – just follow the top navigation bar for promotion info and the left for personal tools. You can use various filter searches on Bonga Hacks. At the top there are filters leading to male, female, new or Spy mode models. To the right you will find a filter that allows you to search the list according to appearance or types of cams. These filters are not very advanced, you can’t search according to prices or to special tags. You must be on the models’ list to begin a search. There is no FAQ page on BongaCams. This is a shame as it is always useful to search FAQ’s and get your much needed answers easily. With 26 languages to choose from, it is safe to say you will understand what is going on no matter where you are from. Thumbs up to BongaCams to for actually writing the names of the languages in the specific language instead of only using the impossible flag system which calls for superman vision and an extensive knowledge of geography. So many pros, so little time. This website has got numerous nice features, a video chat community vibe, decent prices and an excellent choice of models. Also, it really delivers on its promise by not having any extra charges, hidden fees or fine print that you later live to regret. In all honesty, the biggest downside of this website is its somewhat stupid name, because in all other respects it really is pretty great. The profile pages are the only other thing that could use some spicing up! 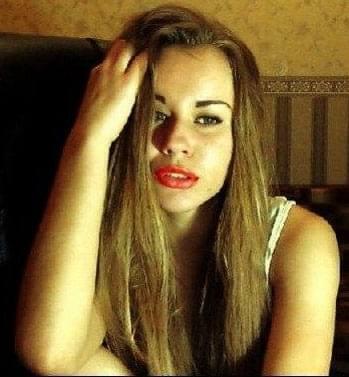 BongaCams is a good choice in the adult webcam world and a highly-recommended one. Don’t waste too much time on the basic membership, because you’ll just end up saying no thanks to the suggestion when you purchase tokens like a million times. Instead, buy a few, get the bonus, start a live show and enjoy. This site will make sure you always enjoy yourself online.